January 1, 2015!! Happy New Year! My New Year is starting out with Flip-Books. 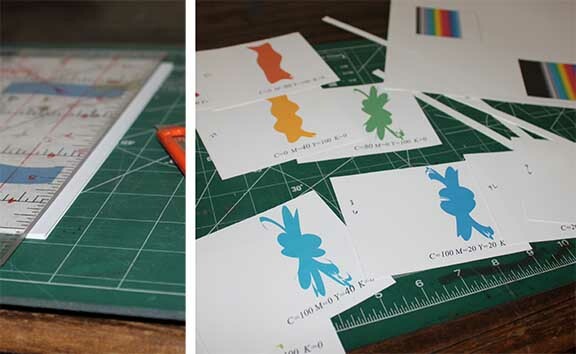 I’m looking to create a template for the dimensions, the paper weight and the binding for a bundle of different flip books.The only way to do this is to just get started. 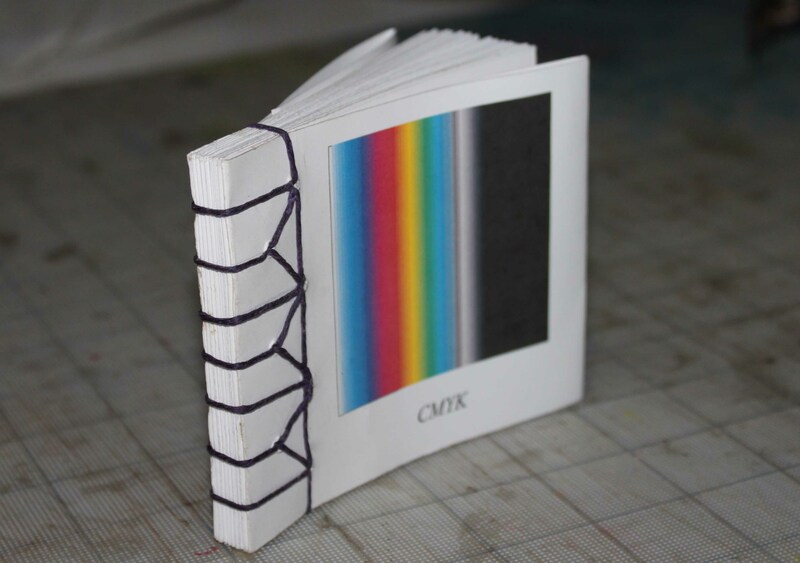 This first book has resolved only the question of dimensions: the pages are each 4.25 inches wide x 3.50 inches tall. 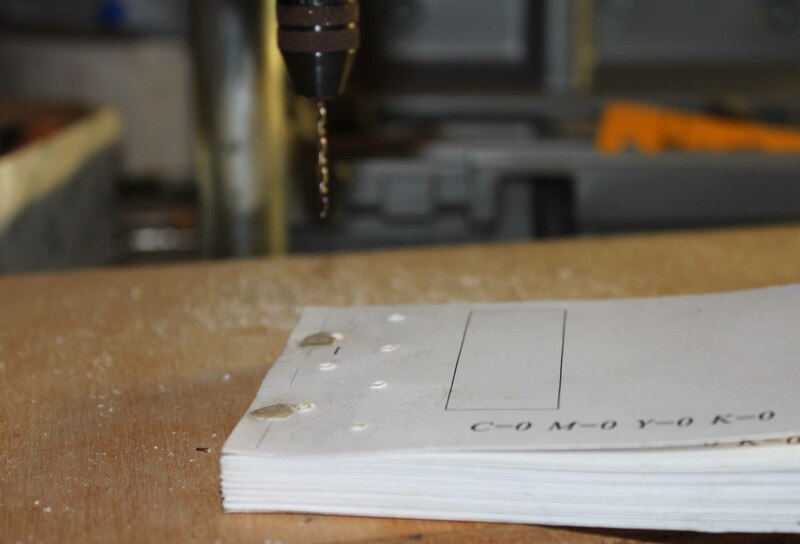 This allows 6 pages to be printed on each 8 1/2″ x 11″ paper, with the grain running parallel to the spine. 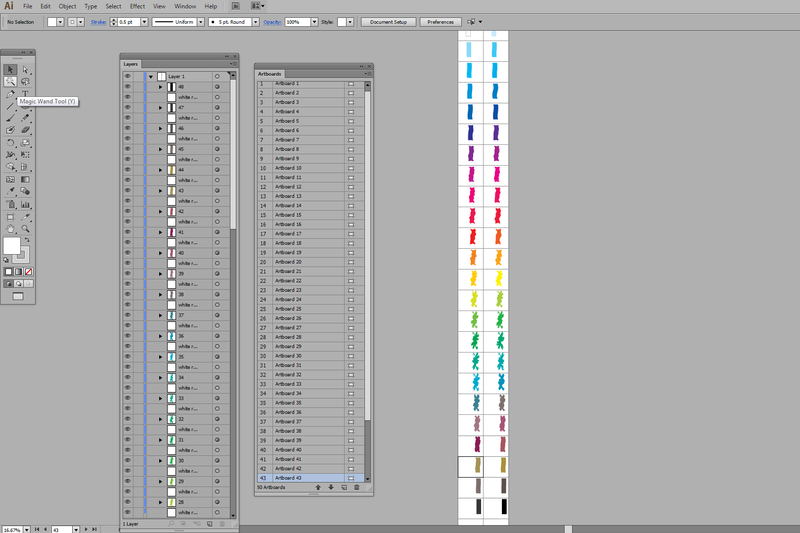 Adobe Illustrator CS6’s grid and its paste-in-place command made creating the graphics fun, once I got my system down. I’ve hand drawn flip books before, but that’s not the route I’ll be taking here, as there’s a certain type of precision I am thinking about. 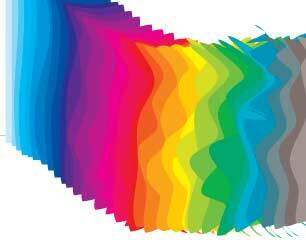 This first book show hue and saturation changes in the CMYK color palette. Right now I’m not as focused on the content as I am on the structure. This post shows the journey of this one book. I’ll keep trying out papers and bindings until I’m happy with the way it’s put together. 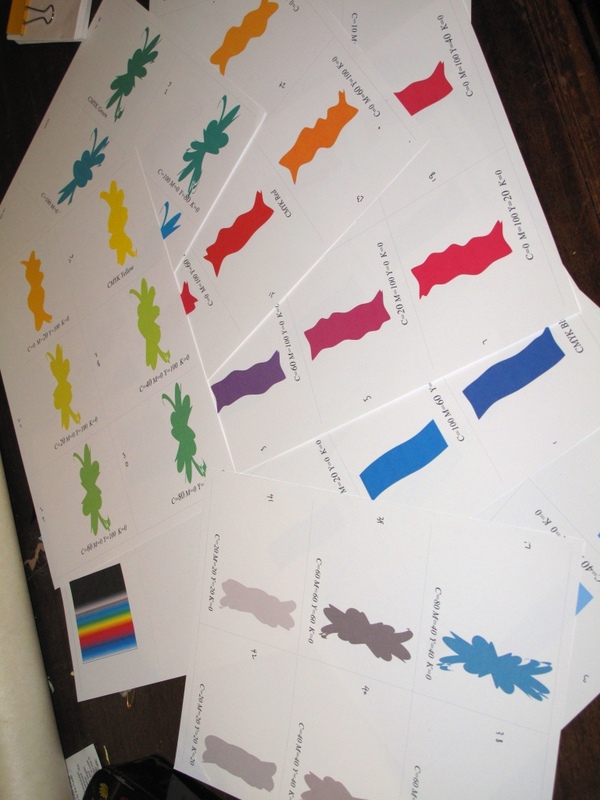 It was exciting to see the pages come out of my desktop printer. I do wish I had a great printer, but one thing at a time. First step is to cut the pages down to size, which I do by hand, then the pages are put into one pile, in the right order. 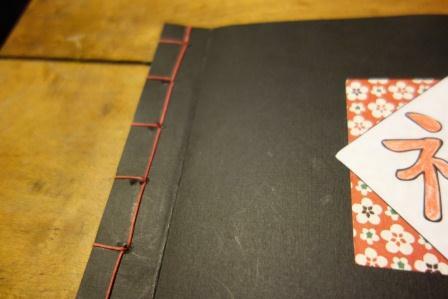 I really wanted to see how my book would look with a decorative Japanese stab sewn spine. There’s a lovely secret inside many of these kinds of bindings, which I included in this little book. 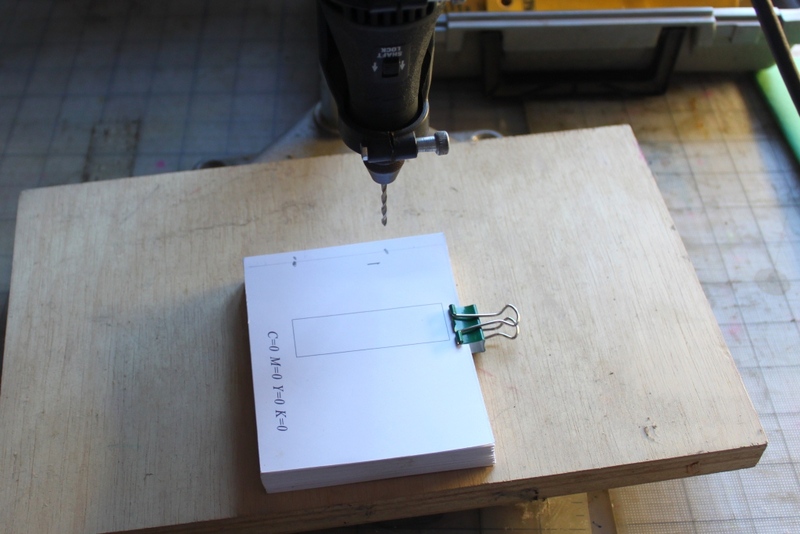 My trusty Dremel drill makes two holes through the pages of the book. 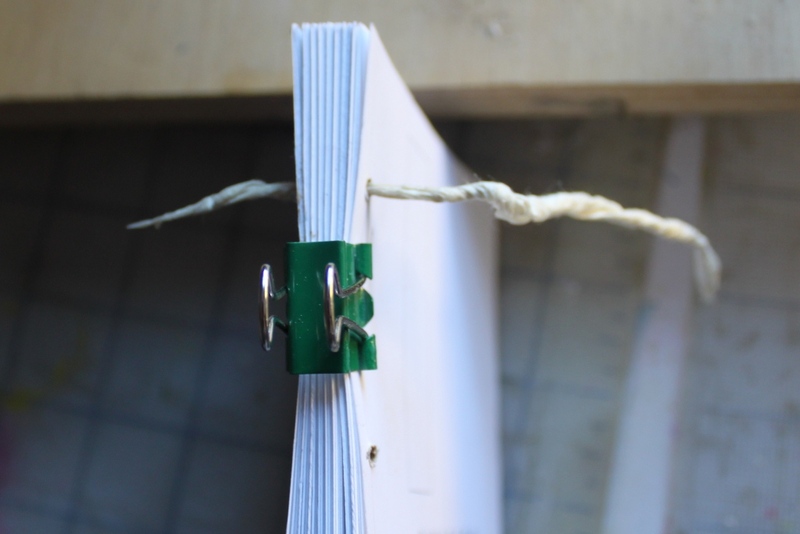 I cut a 6″ x 1″ piece of strong, thin paper twist it and thread it through the book. I snip off half of it to use in the other hole. Then I continue to twist the paper. 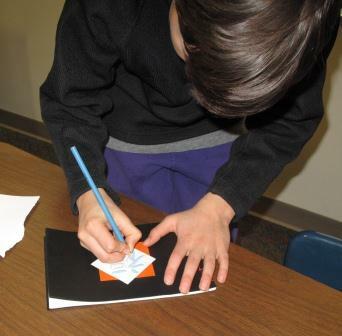 After a bit more twisting the paper tries to form itself into a spiral, which I absolutely, gratefully accept. 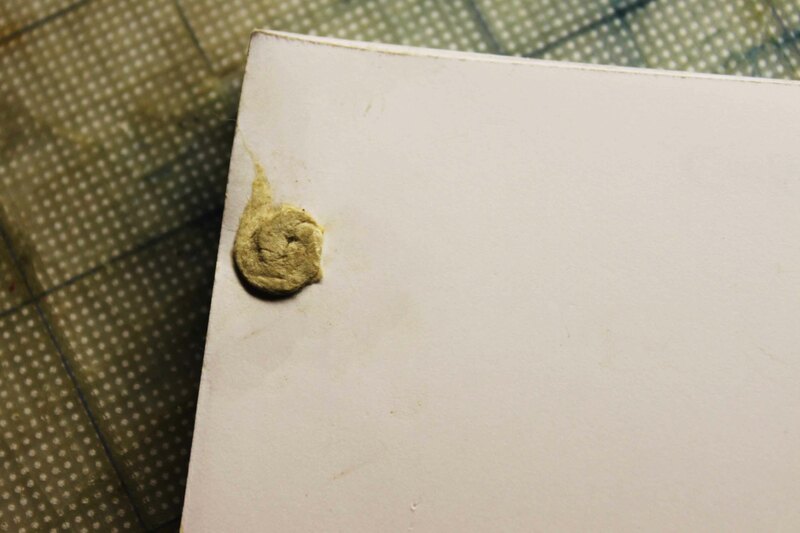 I apply a dab of paste to the spiral and then, with a protective piece of wax paper on top, hammer the spirals flat. Now it’s time to prepare the book block for a cover. The sewing pattern I decided upon needs seven holes. Notice that the spiral are placed in such a way that they don’t overlap with the cover holes. 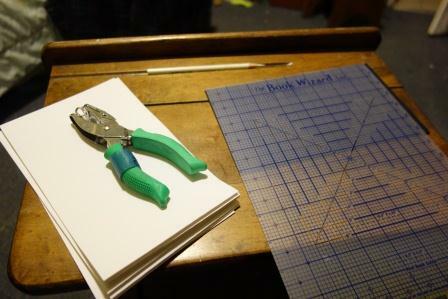 After drilling the holes in the book block I pierce the cover holes using an awl. It’s lots of measuring but easy enough to work out. Here’s the finished book. 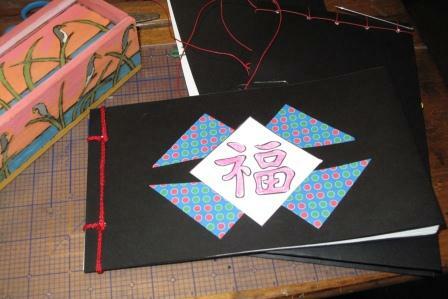 This is what I learned from this process: I will not be doing Japanese stab-sewn bindings on these books in the future. For one thing, this method challenges my Number One Fundamental Rule of Book Making, which is, Do Not Get Blood On the Book. 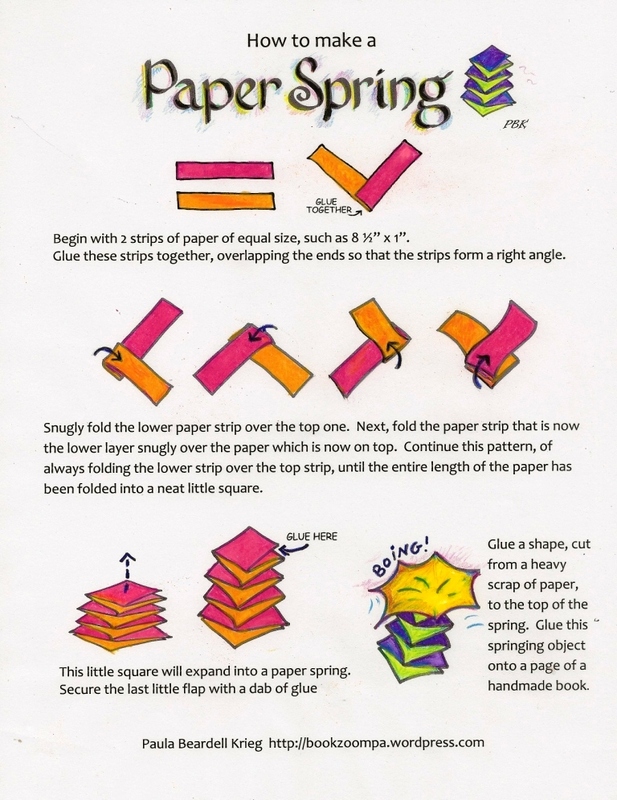 Also, this sewing method was developed for thin, strong handmade Japanese papers, and can look awkward on Western copy paper. It looks fine in the photo, but less so in real life. I’m going to try a simpler binding next time. Also, I’m not convinced the Hammermill 60lb Color Copy Digital Cover paper (a personal favorite) is the right paper to use for this. I need to try out some other papers. Now, if you are feeling unsatisfied with the just looking at this little book without being able to flip through it, here’s my gift to you,which is GIF for you: a GIF animation of the unlabeled pages of the book. Special thanks to Iva Sallay, who put an animated gif puzzle on her Find the Factors site, which gave me the confidence to figure out how to do this. If the box below doesn’t animate, click on it. The image should run through twice. Success! 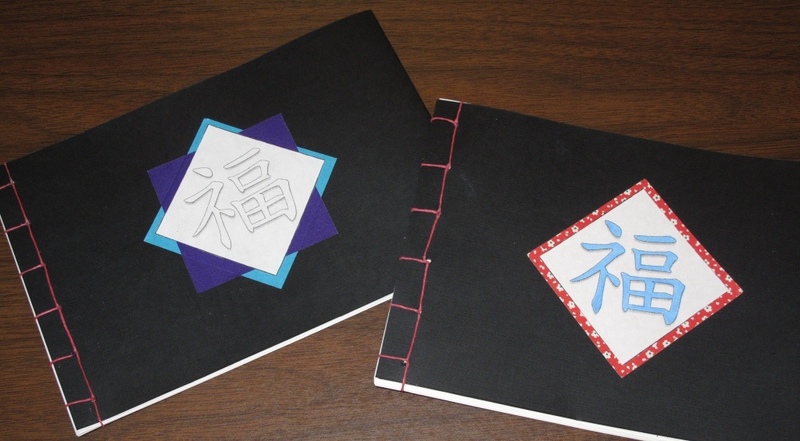 I had one classroom period to help Mario’s Mandarin students make a Japanese-style bound book. I was nervous about teaching this class because I don’t think that I’ve ever taught Japanese binding. Since my daughter is a student in this class I especially wanted the outcome to be good. This won’t be a step-by-step tutorial, but if you want one I suggest checking out http://beccamakingfaces.com/theory-of-japanese-stab-binding/ for lots instruction, history, and beautiful samples. Also, my last post has more details on how I designed this project. 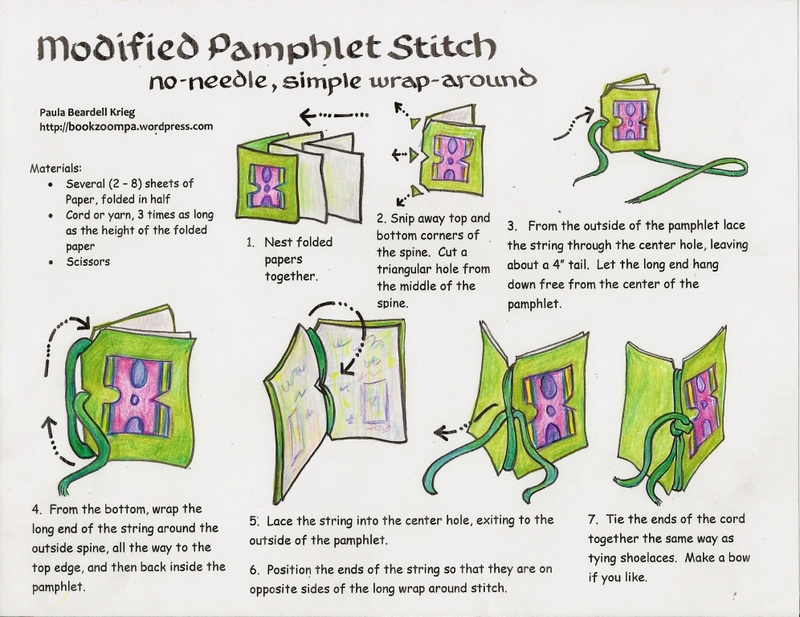 The one bit of instruction that I do want to record here is the method I used to teach the sewing. First let me say that if you are already familiar with Japanese binding you will notice all sorts of ways that I deviate from traditional methods: the ways that I teach in classrooms are always modifications of classical techniques, otherwise projects would take longer than the time that I am allowed. And, yes, I am sometimes self-conscious about the ways that I wander. …nothing. That’s it. Nothing. I showed them the final look of the sewing and I asked them to work it out themselves, only telling them that they shouldn’t sew over any spot that already has sewing on it. 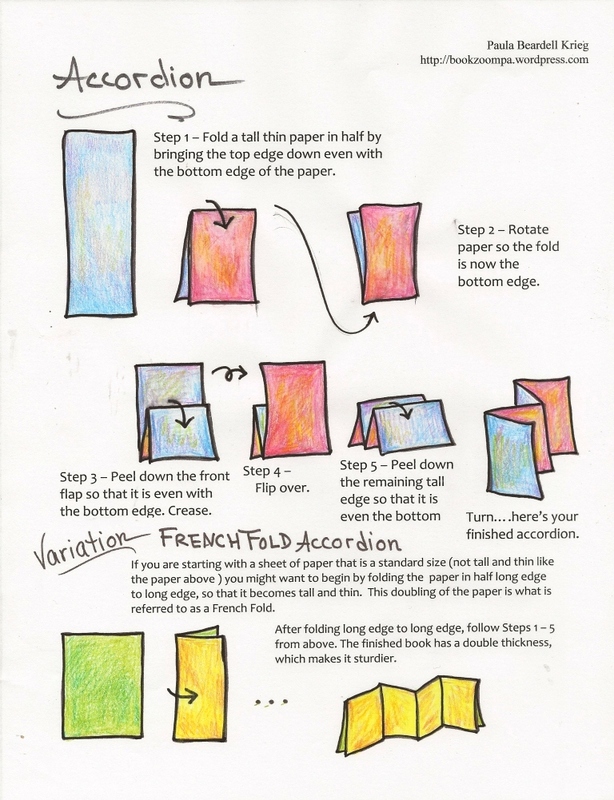 This is a great way to instruct, and I do this sort of teaching more and more often, especially when the steps are easy to see but difficult to explain. Well, it worked like a charm, and each student was able to do the sewing much more quickly than I had projected. This was great, because it meant they had more time to decorate! These are my daughter’s hands above. Her work space looks eerily similar to mine. 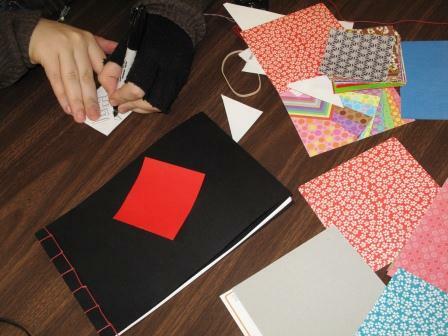 The students seemed to like having the origami papers and the symbol Fu, which I am told means luck or fortune, to glue onto their book covers. 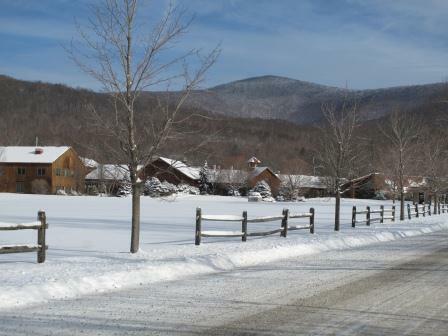 When the class period was over we cleaned up quickly, and I drove home slowly, as the snow from the day before was blown all over the roads. Driving slowly was fine, as I could better take in the views. 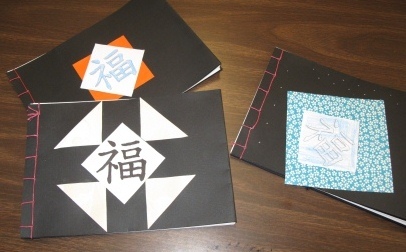 My daughter’s Mandarin teacher and I came up with the idea spending one class period making Japanese-like bound books. Tomorrow is the day that I go in to work with his eight students of various ages. 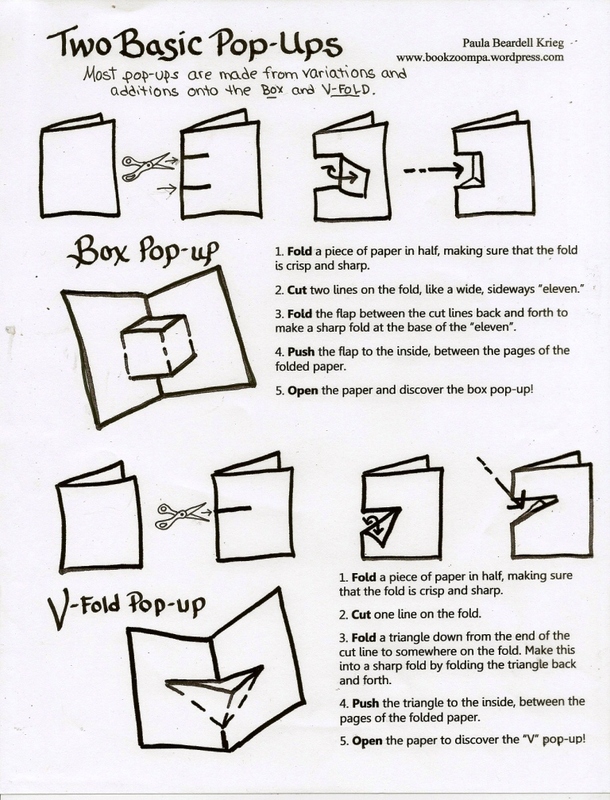 I thought that this would be an easy class to design: take some papers, fold them, punch in some holes and sew. I’m not using traditional materials so things didn’t go as easily as I had imagined. I’ve spent some time, then, working out different variations that might be successful. One of my experiments was making just two holes to sew through, using craft cord and a big plastic needle. This turned out just fine, but my daughter was not impressed. She liked the look of the sample that I had made using waxed linen thread, and bookbinder’s needles. This sample, using needle and thread, came out okay, but I didn’t like how the sewing stations, which were punched using an awl, were so ragged. Also, I wasn’t sure if the students could handle the needle and thread. I sent this sample into school for the class to see, and the consensus seemed to be that the students wanted to work with needle and thread, rather than with yarn or shoelaces. This evening I tried out making various sized holes in the covers using a hole punch, so that the edges of holes would be smooth. The punch that gave me the best result makes a hole that is about same diameter as my needle. 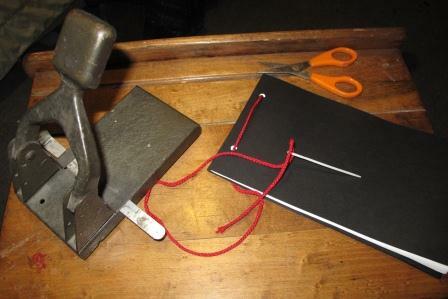 I used this punch just for the covers, then used my awl to drive holes through the inside papers, while the covers were clamped to the pages. This sequence of working kept the sewing stations lined up nicely. After playing around a bit more I’ve decided to bring in materials so that students can choose between using craft cord and two holes, or using waxed linen thread and five holes. 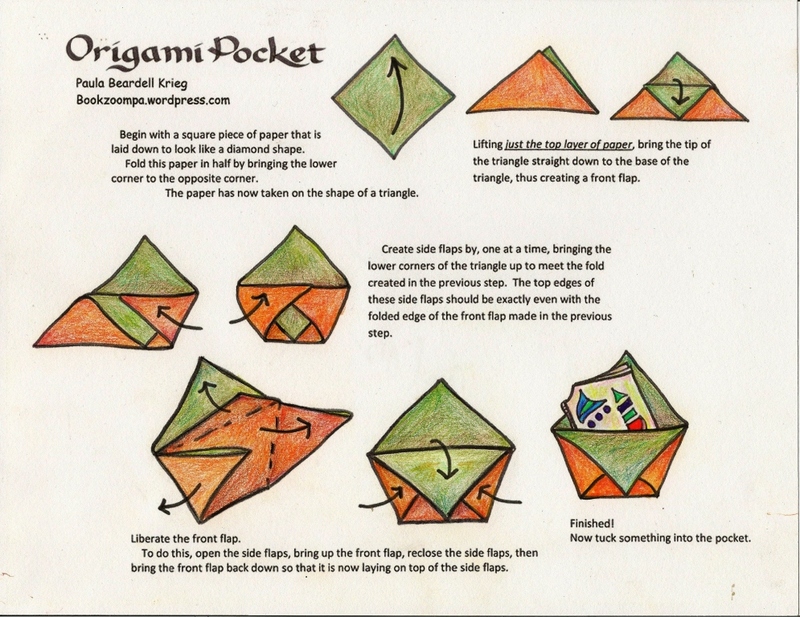 I’m bringing in some origami papers and some symbols of Fu, the symbol for luck, so that they can decorate the covers. 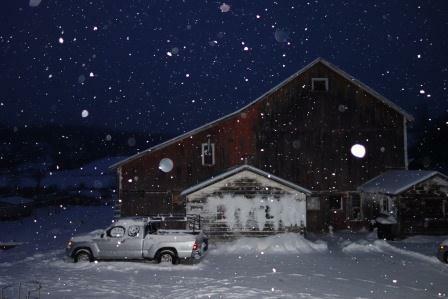 Now, if it ever stops snowing , I might actually get to do this project tomorrow morning!